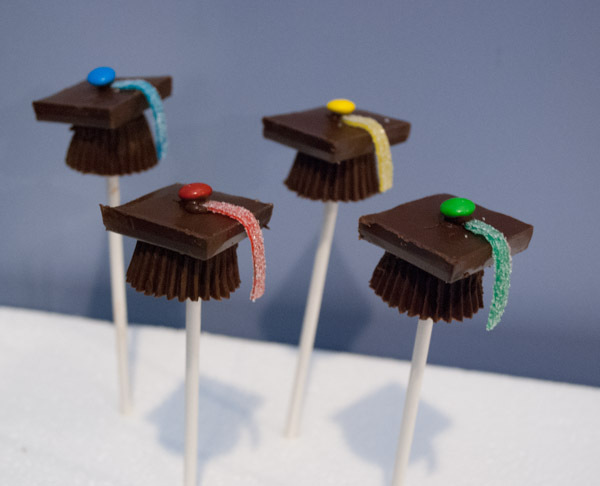 It’s that time of year – and here’s a sweet way to say “congratulations” to the graduate! Try your hand at this super easy, two-ingredient pumpkin brownie recipe. We make these every fall! They are gooey, not cakey and will work well for cake pops. Pour the brownie mix into a large bowl. Add the pureed pumpkin, mix well, and pour into a greased 9×9-inch pan. Bake at 350 degrees for approximately 25 minutes. The batter should be set in the middle. Let the brownies cool completely. Cut the fruit leather or candy into strips. Scoop a generous spoonful of the cooled brownie into your hand and form a ball. Place the ball onto a lollipop stick. Use a piece of foam to hold the sticks upright. Dab melted chocolate onto the brownie pop and place a Ghirardelli Square on top. 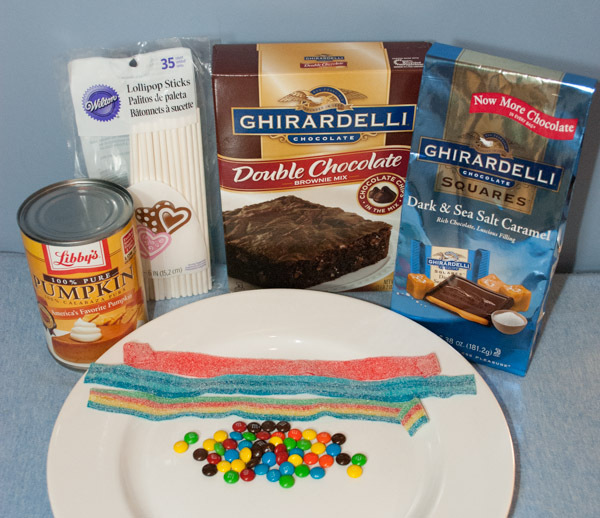 Use a toothpick to add another dot of melted chocolate on top, drape a strip of candy down the side, then add a mini M&M on top. 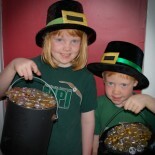 The chocolate will take some time to set. Ghirardelli Squares. Do not use filled ones, because you will trim them. Place a Mini Reese’s onto a lollipop stick. Use a piece of foam to hold the sticks upright. Trim the Ghirardelli Square to match the size of the Reese’s. Approximately a ½-inch off of the top and one side of each square. Add a dot of melted chocolate on top of the Reese’s. Place a trimmed chocolate square on top. 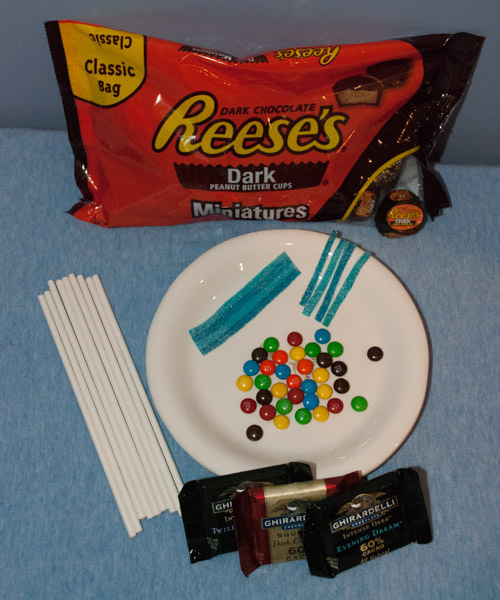 Use a toothpick to add another dot of melted chocolate on top, place a strip of candy down the side, then add a mini M&M. The chocolate will take some time to set. I’ve seen many versions of these on Pinterest and borrowed the idea of the mini-M&M and fruit leather on top. Enjoy! 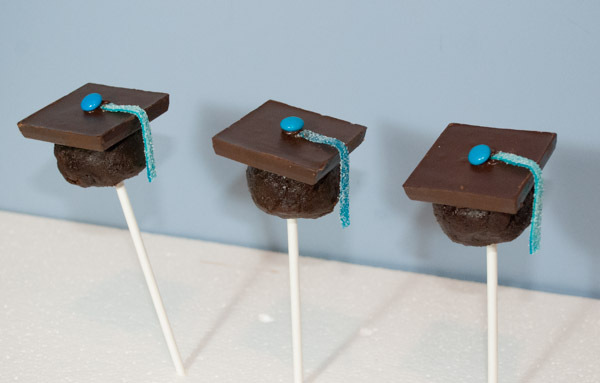 This entry was posted on May 16, 2013 by mdaucello in Crafts, Recipes and tagged brownie pops, candy, cap, chocolate, graduate, graduation, Reese's.